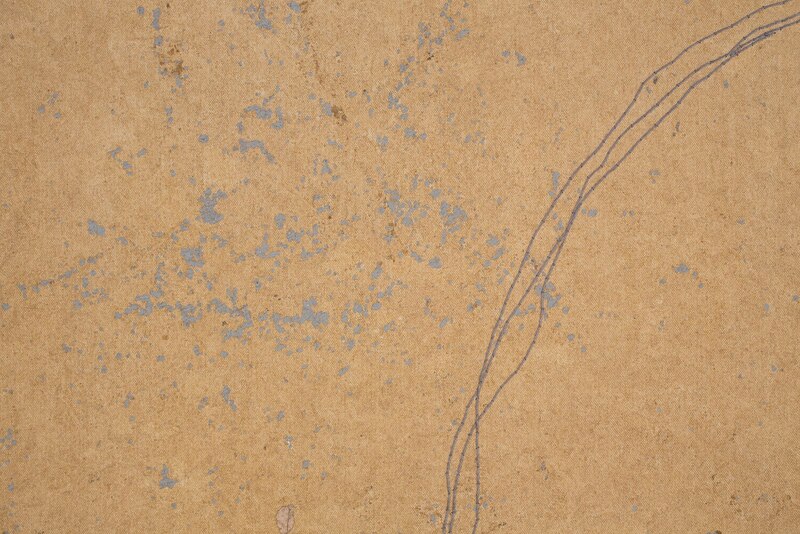 'Watering Hole' (detail). 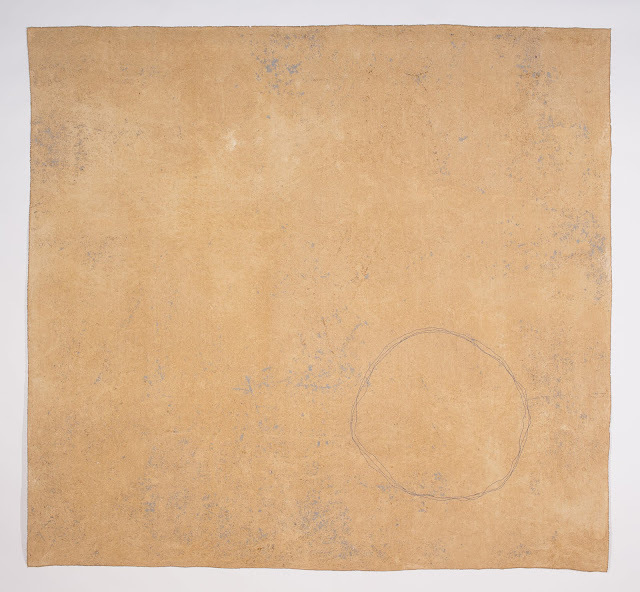 Claire Benn, Textile Artist, 2015. The Acoma Pueblo is a Native American pueblo about 60 miles west of Albuquerque, New Mexico. 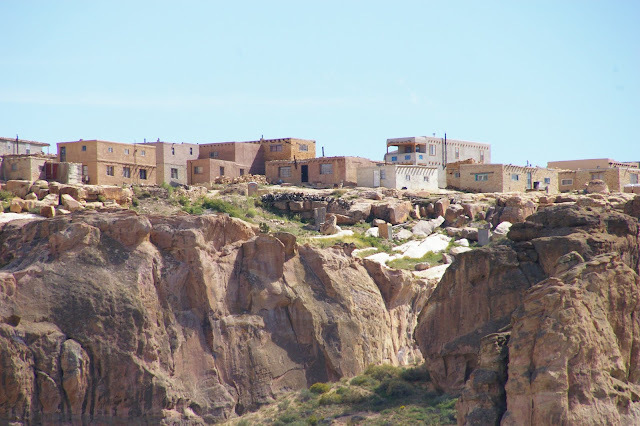 The Acoma people have lived in this region for more than 2,000 years, one of the oldest Native American settlements in the US today. Textile artist Claire Benn traveled with her husband, James, to the region as part of a tour of the Southwest's textile museums and communities. "The feelings I have when I am in the desert are generally feelings of peacefulness, of solitude, of remoteness, of reduction in a way because it is a desolate place and there is nothing there", Claire concludes. Her goal in trying to translate those feelings into her surface design is to keep the work simple; to try and do as little as possible to the piece, communicating a sense of the place, and feeling a sense of openness and relaxation while looking at the finished work. 'Traces of Time; Watering Hole' (2015). Photograph: Kevin Fitzsimons. "I spend a lot of time, as I tend to do, just sitting, looking and absorbing the feel of the place", Claire says about the region. "It's an extraordinary place, the light is fantastic, which is why so many artists including Georgia O'Keefe and Agnes Martin chose to actually live there and make their artwork. In a sense that was one of the things that attracted me out there." While there Claire heard the story of the Acoma people and their struggle against invaders. The Spanish had arrived and desired the land for their own. Unable to forcibly remove the Acoma people from their stronghold, they set out to poison the only well serving the community. The story had such a great impact on Claire that she entitled a piece 'They Poisoned the Well' -- a reflection of both the earth elements she collected to be incorporated into the piece as well as the event which disrupted forever a 2,000 year old community in what is today New Mexico. 'Traces of Time; They Poisoned the Well' (2016), Claire Benn. In addition to producing some incredibly beautiful and evocative textiles, Claire is an author and instructor. Several of her books as well as her workshop, Exploring Fiber Reactive Dyes, are available from Galli Publishing. Exploring Natural Dyes with Michel Garcia and Yoshiko Wada in Brittany France!